When they cleared us out from our homestead under the bridge a short fat man in a fluorescent vest and a hardhat told me I could get a spot in one of the new apartments but would have to give up the dog. I remained stoical and walked away, dignified but emburdened by the torn-down tent and the backpack and rat-killing BB gun and the deflated air mattress and the Ancient Chihuahua’s tiny claws shredding my belly flab as he tried not to fall. 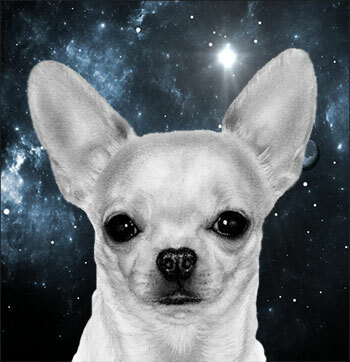 I found the Ancient Chihuahua when he was new to this earth, beamed down from space in a satellite ray. He had landed in an oil slick behind some dumpsters and didn’t know which way was up, a symptom of how unaccustomed he was to planetary gravity. I could tell right away that the Ancient Chihuahua was ancient. His fur was silvery and the downy wrinkles around his eyes showed deep wizenedness. I did not know why the Ancient Chihuahua came to this planet, but I had a feeling that maybe he didn’t come here purely of his own choice. That maybe he had been banished. There were burrs stuck in his tufted eyebrows. He slunk more than he strutted. I was careful not to have these thoughts when I made eye contact with the Ancient Chihuahua, in case my doubts about his character bled out of my pupils and into his brain. He often seemed anguished, and not at all like he was having a fun touristical time visiting the Earth. When he got especially moonsick he stared up at the night, yowling, turning tight circles, burrowing into the dirt as though he was digging his own grave. I empathized with the Ancient Chihuahua. That was why we got along. Having disliked the homestead under the bridge, with its car noises and rough gravelly ground, the Ancient Chihuahua and I welcomed an excuse to move. We needed our own patch of wilderness, I decided, where the Ancient Chihuahua could roam and have a clear view of the sky and his former moonhome. The Ancient Chihuahua liked smelling fresh breezes, he liked listening to running streams, and most of all he liked eating fish, so an island in the river was an obvious choice. I scouted our next domicile from the shore, where a hiking path climbed to the edge of the cliffs above the water. At every break in the trees metal signs counted how many people had died trying to swim in the river. Their mistakes had been not having the Ancient Chihuahua for help and protection. Eventually I identified an island that looked suitable: big enough, safe enough, in between two sets of protective falls. I loaded up the backpack with food, strapped the Ancient Chihuahua across my chest, and in the middle of a cool clear night we cast off on our air mattress raft. The raft flopped us softly over the falls. We could hardly feel the underwater crags that tore at the plastic, letting air bubble out of the mattress. We only just reached the island before it deflated. But that’s how fate works, I thought. It was a sign that this was truly our island. I climbed to the highest boulder and stuck some leafy branches in a fissure. They stood straight up, our tiny flags of ownership. The first week was perfect and maybe that should be enough. I set up the tent on a flat clearing in the center of the island. At dawn we would walk to the edge, to a tiny beach just the right size for the Ancient Chihuahua to lap at the water without falling in or hurting his arthritic neck. During the days we clambered around the rocks, spruced up the area surrounding the tent, listened to the chirruping bugs. Our new homestead felt like a perfect garden full of beautiful things. There were no rats to kill with the BB gun. The waters were crystal and turquoise, sunsets were grapefruit, and at noon the heat was tempered by bright white clouds that puffed across the sky. We lived off the land, and the land was tinned fish and canned beans and cereal bars and cookies and peanut butter and apples from my backpack. We watched a beaver chew down trees on the shore. We saw the big Ospreybird diving for her meals and did not yet know that she was our enemy. At night the Ancient Chihuahua snuggled next to me in the sleeping bag, kicking his little legs, dreaming of chasing meteors. What people get wrong when they talk about us is that the Ospreybird wasn’t on our island. She was near our island. Her big nest was high above the water on a dead tree trunk that was on a different island upriver. The Ospreybird is not the real victim in this situation. In the beginning, the Ospreybird just dropped some fish skeletons on our island. Spines with little bits of flesh still on them, or one fluttering cellophane fin. The first time the Ospreybird dropped a corpse the Ancient Chihuahua looked at it as though hell had opened up in the sky. He jumped straight up in the air and would have stayed there, floating from fear, if I hadn’t calmed him down. The Ancient Chihuahua had never seen a living fish before. Or a freshly dead one. He was crazy for the tinned variety, though. The oilier and stinkier the better; his preference was sardines. Before we went to the island he had tried salmon, trout, clams, oysters in brine, herring, and mackerel. Anchovies he found slightly too salty, and he smacked his lips for hours after eating them, flashing his tiny triangle teeth. So when fish started raining down from the sky I thought it was a nice thing. I had intended that, living on the island, the Ancient Chihuahua would switch from tinned to fresh fish. I had a fishing line and was making stick traps, but my skills were rusty and I hadn’t yet caught much. I thought, at least the Ancient Chihuahua has something to nibble on while I get things going. The more time I spent fishing, the more people saw me. When I fiddled with the traps hikers pointed and waved. Some of the kayakers who passed regularly started tossing sandwiches and candy. I appreciated that, as I did not share the Ancient Chihuahua’s appetite for minnows, but it also made me nervous. Our homestead was meant to be private. I had hidden our tent within a latticework of branches and leaves. I avoided walking on the south side of the island, the most exposed part, during the day. I avoided making eye contact unless it was with a soggy flying Hershey’s bar. The day I caught my first big fish, with glittering green scales in stripes down the side, I ran proudly across the island to show the Ancient Chihuahua. It was late and the light was dusky purple. I found the Ancient Chihuahua lying near the water, watching the sky. The Ospreybird was swirling around high overhead and the Ancient Chihuahua was tracing her path with his eyes. Every few minutes the Ospreybird’s wings covered the low sun and cast us into eclipse. I dangled my fish in front of the Ancient Chihuahua’s nose. He sniffed at it but kept his eyes on the Ospreybird, who was now facing into the wind, beating her wings slowly up and down so that she stayed suspended in place. Then the Ospreybird started to dive, and the Ancient Chihuahua hopped to his feet and started barking and barking. The Ospreybird raced downwards, crashing into the river’s surface before pulling herself up and away. Shining drops of water fell from her dark feathers. In her talons was a fish much bigger than my fish. The Ospreybird flew back to her nest and the Ancient Chihuahua stopped barking. He walked a few feet away and then seemed to remember that I was there. He trotted back and sniffed the air around where I had been dangling the fish but I pulled the fish away. I had put a lot of work into getting that fish and I wanted the Ancient Chihuahua to appreciate it. I had wanted to do the work but it was work all the same. I stormed away and started to make a fire. My fish was a beautiful fish and I would cook it and eat it. I would give the Ancient Chihuahua half, as was only fair, but he would know by the fact that it was cooked that I was mad. He knew that I knew that he preferred everything raw. While the fish was cooking I went back to get the Ancient Chihuahua. I had felt guilty as I put the fish over the fire; it would have been easy to hack it in half and keep some raw. The Ancient Chihuahua was in the same spot where I had left him, only a little bit closer to the water—as close as he could get without being wet. The Ospreybird was in her nest, eating. She dug into the still-twitching fish with her beak, pulling apart long pink ribbons of sinew and flesh. It was the worst thing I had ever seen. When we had lived in the homestead under the bridge, when we had lived on the screen porch of a cabin in the park, when we had lived nowhere and everywhere on the sidewalks, the Ancient Chihuahua had stayed with me. He nosed me awake in the mornings if there were people coming by. He whined if there were bigger dogs or squirrels or rats so I knew to ready the BB gun. He ran on his stumpy legs to match my stride and pawed my shins when he preferred to be carried. In the city people looked at him instead of looking at me and he absorbed it all, drawing danger away from me, leaving me free to simply breathe and live and sleep and dream. I thought that I did the same things for him. I found him food and poured cans of peach iced tea straight into his mouth. I kept him away from alleys where there were humming electrical generators and broken down refrigerators, whose noise and Freon smell made him nervous. I rubbed his belly and scritched his head. I glued up his torn ear after a raccoon got to him and put baby Benadryl in string cheese when he had allergies. I monitored whether the moon was too close or too far, too big or too small, and anticipated if the Ancient Chihuahua would be happy or sad or sick or mad. I did not think love could change as easily as the places we slept. I woke in the middle of the night and the Ancient Chihuahua was not in the sleeping bag. He was not in the tent at all. I listened for the sound of moonsick howling but didn’t hear a thing, and I felt ill, ill. I left the tent and looked up at the planes and spaceships blinking among the stars. I walked around the edge of the island, climbing over the rocks and the dead tree trunks and the bog of plastic bags. I found him where he had been sitting earlier, at the far edge of the island, closest to the Ospreybird’s nest. The Ospreybird was sitting upright at the end of a tree branch. Her head was twisted back over her shoulder. She stared at the Ancient Chihuahua with yellow eyes. They were both still, focused, each anticipating that the other would move soon, and I felt the anticipation hovering like a string between them. I waved my arms up and down to break the string. The Ancient Chihuahua flicked his eyes towards me but the string remained. I started to see the truth: This bird was going to try to take the Ancient Chihuahua away, away from me, from the island, from the world. I saw that she was dangerous, and I saw that the Ancient Chihuahua did not see this. The Ancient Chihuahua had lived a gilded life with me protecting him. His paws were soft from being carried, his belly plump from all those tins of fish, and now here was a predator of galactic scale. I did not think the Ancient Chihuahua was strong enough to fight her off. I would have to do it for us. It was not very easy to plan our escape without the Ancient Chihuahua noticing, but I knew we needed to leave. I began thinking about how I could patch the air mattress raft, imagining that we could set out and see where the river took us. I pictured landing on a soft sandy beach or maybe a green reedy marsh. I pictured saltwater taffy and thick-cut French fries. It would be like it always used to be only better. I used parts of the tent to repair the raft, gambling that better tents awaited us downriver. I used some of our first aid superglue to make the patches watertight. Unfortunately, the Ancient Chihuahua, having been cured with the first aid superglue in the past, had some negative feelings associated with its smell. He started getting suspicious as I began cutting up the tent, and when he caught the superglue scent he became crankified. I had told him before that this was all for his own good, howevermuch it hurt, and I told him so again. The morning light was silty and gray, a bad dream type of light. The Ancient Chihuahua was sleeping in the half-torn tent and I tried not to wake him by moving too much. He always felt every vibration in the earth as though it were an earthquake. He should have been impossible to startle but instead was startled every time. I lifted him gently up in his blankets, petting his ears with my fingertip to keep him calm, and strapped him around my chest. His head poked out between two buttons on my shirt and for a while he dozed peacefully. His weight and the weight of the backpack were about even and I felt perfectly cantilevered. The mattress raft floated easily on the shallow water right around the island. I waded in, pulling the raft out to where it was deeper. The cold water edged up my thighs. I took another step and suddenly the rocks dropped away under my feet. I fell forward onto the raft, landing clumsily on my knees, and the Ancient Chihuahua wasn’t dozing peacefully anymore but sniffling in a panicked way. It’s okay, I told him, it is okay. We were still in a slow eddy by the island, not yet thrown out into the center current. I wanted the Ancient Chihuahua to calm down again before I cast off for good. I did not want him to flail and cause us to capsize. I wanted to look at the island and keep only the good parts in my memory for later. Then I heard the Ospreybird wailing. Her wings beat down the air and I felt wind on my face. The Ancient Chihuahua started to wriggle. I squinted my eyes against the growing lemon dawn light and kicked out my legs to propel the air mattress raft forward, out of the eddy, away from the island. Maybe the Ancient Chihuahua was tired of life. Maybe the Ancient Chihuahua wanted to go home. Maybe the Ancient Chihuahua changed at a different pace than I was changing. Maybe the Ancient Chihuahua was confused and wasn’t doing what he thought he was doing. Maybe the Ancient Chihuahua and the Ospreybird communicated on a frequency that I never had access to, because they were more like each other than either was like me. Maybe the Ancient Chihuahua was sick and had an amoeba in his brain, an amoeba he caught while we airmattressrafted down the river, an amoeba that was my fault but that proved it wasn’t really that he wanted to leave me. Just as we began moving swiftly away from the island the Ancient Chihuahua got out of my shirt. He tumbled onto the air mattress and then slid, or stepped, into the river. He disappeared under the water and I screamed. I jumped in, leaving the raft behind. I was caught in a current, swirled around, and I couldn’t keep track of where the Ancient Chihuahua had gone under, or of where I was, or of where our island or our raft were. I pushed my legs against the algae slimed rocks and muddy riverbottom. I grabbed at sticks that poked out of the water. I tried to keep my mouth above it so that I could breathe and as I pointed my face up and back above the froth and spray I saw the Ospreybird, hovering again, watching. I looked for the Ancient Chihuahua but all the silver grey I saw was rocks or water. The Ospreybird swooped down, flying just above the river’s surface, looking like she was ice-skating. I splashed water at her, flailing my arms, afraid that the Ospreybird had spotted the Ancient Chihuahua, afraid that the Ancient Chihuahua was going to be scooped up in razor talons and shredded to pieces in the Ospreybird’s nest. But the Ospreybird pulled up from the water empty-handed. She flew away and did not even look me in the eye. I looked across the river, at the rapids, at the unfamiliar islands, at the mucky reeds and the air mattress raft almost out of sight. At no Ancient Chihuahua anywhere. The Ospreybird was a small dark dot in the sky next to the pale white day moon. “You took him!” I screamed, even though that wasn’t entirely true. Maybe I would have left it at that if the Ospreybird had looked back at me and I had seen remorse. But she did not. I saw nothing but chill death, so I swam to the shore and collected myself. I hiked along the edge of the water, over the rocks and the bracken, until I was upstream from the Osbreybird’s nest. My arms were sore from being thrown around in the water, my shoulders wrenched from the tangled backpack straps. The BB gun was still in the backpack’s zippered compartment and it wasn’t too too wet so I got it out and waited hours and hours through the heavy muggy middle of the day until the Ospreybird looked like she was sleeping and I shot her. People say the Ospreybird was sick, was weak already, which was why I was able to get her in the wing and in the face, which was why she lost one of her eyes and almost drowned, which was why she had to be rescued by some rangers who watched the whole thing on a video feed from a camera in the trees meant to be used to check if the Ospreybird had laid any eggs. They saved the Ospreybird and sent her to rehab and they found me and put me in jail because shooting a raptorbird is illegal and I had no permanent address where they could send the fine. Unfortunately there is no earthly jurisdiction for attempted raptorbird homicide of an alien dog prince. No one ever found the Ancient Chihuahua, or no one told me if they did. But no stars have fallen onto the earth and crushed us in punishment so probably the Ancient Chihuahua was beamed up home at the last moment, saved from the swirling water and pointy rocks, the biting fish and trapping currents, and as long as I am in jail here the Ancient Chihuahua is in jail on his home planet, serving time for destroying my heart. Gwyneth Kelly is a writer from Washington, DC. She won the inaugural UCL Publisher’s Prize for Student Writing and was a Reporter-Researcher at The New Republic.